Cllr Rósín Howell has called for a piece of waste ground to be converted into parking spaces in Castlewellan. A clear easy solution that solves two problems says Cllr Howell. 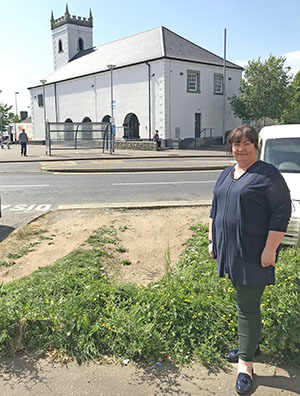 Castlewellan Cllr Rósín Howell has requested that a patch of overgrown ground in Castlewellan be resurfaced and made into a number of parking spaces. The Sinn Féin councillor said: “This is only a very small patch of ground that is overgrown by weeds in the summer and turns to mud in the winter is well known as an eyesore about Castlewellan. “I have therefore requested that this space is paved over and possibly be made into a couple of car parking spaces. For me, this is a simple and cheap solution that would both create much-needed extra parking spaces as well as making the area look tidier.